I am a writer, facilitator, public speaker and coach - passionate about aware and connected leadership, resilience, personal and professional development. Currently writing my first children's book "Little Viking Horse Tales". It’s a long time since I blogged on this page, in fact it was last April! Where did the time go? The title of that blog was Back in the Saddle (Again!) I wrote about how I had recovered my confidence in riding Svipur (Blondie on Facebook), and today, as I read it through again I knew it was all true. But more than that, during 2018 I made another leap forward for me. I am now also riding Fleygur, often and with confidence. In fact, when I want a hassle free ride I choose him! This is HUGE. Roger’s clever, feisty horse was always a challenge for me. He’s high energy and can be tricky to ride. Not the sort of horse I would buy for myself. But of course I love him, and after my husband Roger died suddenly in 2016 I couldn’t bare to part with Fleygur. 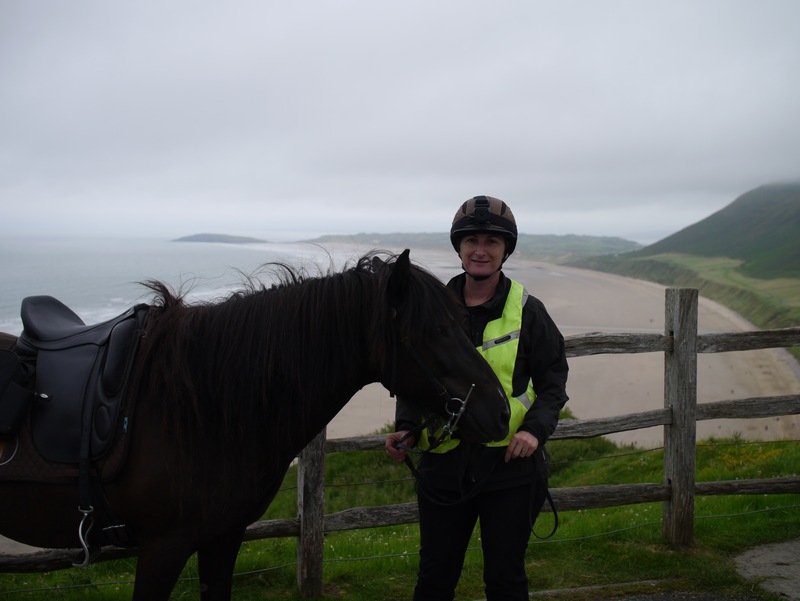 Gradually I plugged away at it, and finally, last summer, on a ride with friends on Gower in South Wales, as Fleygur did his best impression of a fire-breathing dragon all the way back to the yard from our lunch stop, I found I was laughing. No longer holding my breath, imagining him taking off with me, or getting off and walking home (it was too far!) Laughing, and therefore, relaxing. The spell was broken. From then on this was image I kept in my mind. Me riding Fleygur, at his most feisty, laughing. Yes, he can be strong. Yes, if he gets upset I can have my fire-breathing dragon back, and sure he has the fastest going home walk of any horse I know. But actually, he’s a very compliant horse, and once you and he are connected he responds almost at the mere thought of what you want him to do. 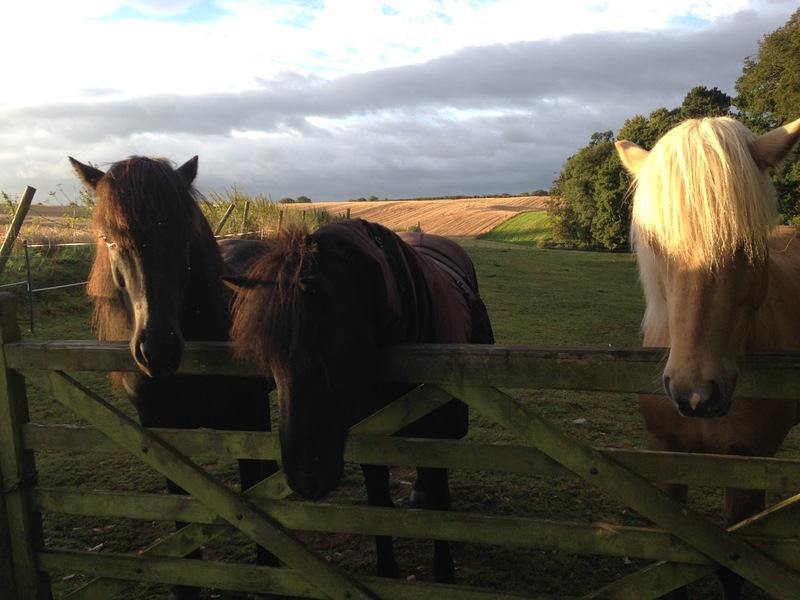 So in 2018 I didn’t blog about my journey, though the Little Viking Horse Facebook page continued most days. I have neglected this website, though in my head I had big plans that I kept meaning to put into action. Two and half years into being a widow – and it took a long time for me to own that word as part of who I am – I have made a new life for myself. The hole remains, but it is easier to live with. I have spoken at a number of conferences and seminars about personal resilience, resilience and authenticity in leadership, drawing on my personal experience. I have a plan to write more about it too, but first I have some other things to do! Over the next couple of months I will be refreshing this website, so that those who wish to find out more about the Little Viking Horse herd, and Icelandic horses in general can do so easily, and, when it goes live, I plan to have a few Little Viking Horse products for you die-hard fans who keep asking me for them! But the most exciting thing for me is that 2019 is when I am going to finally finish THE book! Some time ago, encouraged by Roger, I started writing The Little Viking Horse, a fictionalised account of Fleygur’s life, based on the character of our feisty friend. Last year I finally started to work on it in earnest, with the support of The Golden Egg Academy, and now the story has come together. Learning the craft of writing children’s fiction has been a steep learning curve but I as I move into the next phase of editing and refining I am really excited. I know now I will get this done. I hope to publish traditionally, by persuading a publisher that the world needs to hear about this feisty little horse, but one way or another the book will get done….. Descended from Viking horses, Fleygur is a little horse with big ideas, but abandoned, alone and injured, he believes his dreams of winning the Championships are over. Then he meets 11 year old Roger, the boy who will change his life forever! There, now I’ve said it, it must be done! Back in the Saddle – Again! It dawned on me recently that I have rediscovered my confidence and joy in horse riding, and I am not really sure precisely when it happened. Just one day I returned from a ride and realised that I had thoroughly enjoyed myself. This has happened before, last summer I began to recover some of my confidence, but it was on the odd ride where the horse had been particularly calm, or nothing untoward had happened. I was riding more, but remained very anxious and I know I was not riding as often as I use to, even though I actually had more time to do so. 1. I was riding out on my own often, and enjoying it. 2. On one ride recently Svipur, my lovely gaited Icelandic horse started to canter before I had my reins fully gathered (after taking this photo), I pushed him on with my seat (to make sure I didn’t get Pace) and gathered the reins as I went…and didn’t even think about it until afterwards. I made a mental note to myself: do not ask for canter in your seat and head before you mean to! Horses pick up the smallest of signs, more of this in a moment. 3. Another day that week I chose a ride I hadn’t done for a year specifically for the canter across an open field. 4. On the way home were passing a wind-turbine and there were eight balloons twisting and flapping in a tree on the right, and big scary horse eating rocks on the left. Instead of thinking ‘OMG’ and getting anxious Svipur and I just rode on by. 5. I can’t wait to go out again, and am thinking about all the other neglected rides I have been avoiding. Some steps I took were big, some steps were very small but one of the key things was simply to keep riding, keep getting in the saddle. I was trying to do this anyway, but one thing that helped me keep on track was listening to Karl Greenwood from Centre for Horseback Combat , he talks about being part of the “In the Saddle Division” and this prompted me to tackle my many excuses for ‘not riding today’ – the rain, the wind, feeling a bit tired. I kept taking myself to the edge of my comfort zone, and just beyond. I entered the Shows and went to the training clinics, though to be honest my Icelandic horse friends would have probably come and got me anyway if I had said I was not going to a show! I continued to work on my skills and confidence with lessons and rides with my friend and trainer Fi, but I did all this at my pace. I pushed myself to be in the saddle but I was clear with those I rode with what I was comfortable to do and what I was not. I rode familiar rides, and aimed for short and often. In the end it was keeping riding that got me over the edge. I just kept getting on the horse. Eventually I became bored with my same old ‘safe’ ride around the block and this pushed me to venture out and rediscover some of my favourite rides. I focussed on the positives. Horse riding is not the most dangerous hobby you can do. It really is not. In fact the worst fall I ever had, by a very long way was from my bicycle. Social media can have a powerful influence on our emotional states. It’s wise to consciously decide how you interact with it. Thinking about all the things that could go wrong was crippling my confidence so I stopped reading stories about people having accidents on horses, incidents between horses and cars, and even stories about horses being neglected or abused. I did not what these negative thoughts in my head. I ‘hid’ those stories on my timeline, and for some friends who seemed to repost a lot of such stories – I unfollowed them for a while (so now you know!) I tired to post on Facebook positive stories about my little victories in dealing with incidents while riding – and being okay! That’s not to pretend that bad things can’t happen, or to be cavalier about potential risks, but the best way to be prepared for these is the be the best rider I can be, and to put the work in with my horse so that he is more confident and looks to me for help when we are faced by something challenging. I did question if I wanted to keep doing this. What about just giving up the horses? I made it a question I could ask myself and faced it head on instead of pushing it away. I imagined what I might do instead, what I would lose but also what I might gain (time, money, flexibility, space for other things). I thought about how I would re-home the horses, and this made me cry! So sentimentality did play a part in my decision to keep going (heart) but also a careful evaluation (head) of what I would gain and lose practically, financially, socially, emotionally and psychologically. I decided I would lose too much. My childhood dream – a place to live close to nature, chickens, cats, a dog, a horse (I was never bold enough to think of having more than one!). A hobby that connects with me with others, that is just a little ‘different’. Icelandic horses are quirky – described in one article as the ‘hippies’ of the equine world. Hippies on speed maybe! I have hobby that constantly challenges me to be a better person – kinder, more mindful, more self aware. I have to notice my own energy and mood, and pay careful attention to the smallest of signs in my horse’s behaviour to be the best handler I can. Recently on a Richard Maxwell course on Ground Work I learnt to lunge Svipur with a halter and a rope. After only a few minutes he was changing direction when he noticed me quietly passing the rope from one hand to the other, getting ready to ask him for the change. That’s some responsibility! What became almost too much of a challenge has become a joy. What I had to psych myself up to do has become my relaxation from other tasks. What seemed frightening becomes entertaining, or a challenge to be worked out. It’s a virtuous circle – the more relaxed and certain I become the better my horse feels – the more confidence he has in me – the more relaxed he is the more confident I feel. But I was the one who had to interrupt the negative spiral. I could only change me, my behaviour and feelings. I could not ‘make him change’ He changes because he wants to, because I am offering him easier options and confidence to do what I ask of him. And isn’t much of this the same with people? You can not force other people to change, but you can change how you respond to other people. You can not change what has already happened, but you can change how you respond to it. It’s about taking control of your life and believing in yourself. It begins with connecting with yourself, facing the challenging questions, having a purpose or goal and going for it….getting back in the saddle. I am sure there will be set backs, I may have to face this journey again, but for now I am back in the saddle and loving it. 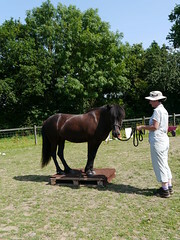 When Little Viking Horse recently announced on Facebook how pleased I was with myself for successfully mounting from the ground, I received a lot of requests for more details of the ‘programme” I had undertaken to achieve this, and I am quite happy to share what I did and what I have learned. There is good psychology around the suggestion that announcing your goals to the world, or at least your nearest and dearest is a good motivator to help you achieve them, but for some reason I kept my newly found determination to be able to mount my horse from the ground to myself. Maybe I didn’t really know that this was what I was aiming for when I stared ‘the programme’ a couple of months ago, or perhaps I wasn’t sure I could really do it. After all, in every house I have lived in for the past twenty years or more I have fitted an extra handrail on the stairs because of the tendency for my right knee to give way without warning. Added to this I have a weakness in my lower back, perhaps as a result of the whiplash I sustained in a car accident many years ago, and a left hip that hurts if fully flexed, remnants of a serious cycling accident, or just over tight hip flexors? Who knows, but I had a whole list of reasons why I couldn’t mount my 14 hand (142 cm) Icelandic horse without using mounting block, and I was very grumpy about it if any of our imaginative Icelandic Horse events in the UK required ‘mounting from the ground’ as part of a class or test. 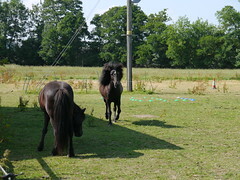 Once I had gone through the list of my physical restrictions, and pointed out that my Icelandic horse is taller that most, I then went on to explain that in any case it is better for your horse if you mount from a block, because there is less strain on them. I do actually think this is the case, and I also believe it is important to vary the side you mount from. After all in strength and flexibility exercises great emphasis is put on working both sides of the body equally, so to my mind this should be applied to mounting your horse too. However I do also think that being able to mount from the ground is an important skill to have, if you can. You never know when it might be necessary, and I am sure I am not the only one to have had walk a while to find something to stand on while out hacking, or to have used a rock that turned out to be less stable than it appeared! Stretches that open the hip joints for example Lunges and Pigeon stretch. Strengthening my quad muscles and glutes – for example Pilates Squats (lots of them!) and Bridge. And finally balance postures, because when you mount you have to stand on one leg! Getting greater flexibility in my hips, strengthening the muscles that support my back, stronger legs and core to help me up, and improving my balance were all factors in my success. Though I should point out this is still work in progress, in part because of the other two elements, which I am about to come on to. To be able to mount safely my horse needs to stand still, and this is even more important when I am mounting from the ground. with one foot up in the stirrup and hopping on one foot, I don’t need my horse to move as well. Horses can learn to stand still, but it takes consistency in handling and clear boundaries. I know this, because I fail at it often. Svipur (aka Blondie) is more easily distracted than the other two who will stand absolutely still. He has a tendency to fidget when I am getting him ready. He is actually quite good at standing still for mounting, but not 100% and that makes me nervous. Within a few days of me resolving, again, to be more consistent in my expectations of him he was standing perfectly still, tied to the gate in the field while being brushed tacked up. All I did was set the bar higher than before. He can shift his weight and reposition his foot to be more comfortable or balanced, but he can not take a step. If he takes a step I simply and quietly move him back. No big deal, no ‘telling him off’, just light pressure until he steps back. He knows the rules and relaxes. I don’t try to mount until he is standing still and looks like he is going to stay there. If he moves while I am getting on, I get off and do it again. If he moves a lot, I turn him in a circle back the way he came and ask him to stand again. I never ever ride off until he is standing still. If you like riding race horses and enjoy the thrill of hoping on a spinning horse and gathering your reins and balance as you head off, then I guess this blog post is not for you! Personally I don’t want to fall off before I start. Svipur learns this really well, it is me that needs to stick with the programme! There is no physical reason why I can not mount my horse from the ground. I know that now, because I have done it. Actually I have done it once or twice before at horse clinics. I did find a slope in the ground and placed Svipur downhill to make it easier, and then asked someone to hold Svipur and the opposite stirrup. I was very insistent that I was rubbish at mounting and that they would have to ‘lean hard into the stirrup’ as a hauled myself up. Invariably they told me that they didn’t have to use much pressure at all, but this piece of information got lost in the ‘I can’t do this’ mindset. However, I did on most of those occasions pay with a sharp pain in my hip or a twinge in my back, so ‘I can’t do it’ still won. So that’s how it came about. Of course I insisted she held the stirrup, and that she would have to lean really hard on it, but I got on. I hopped off. “Do it again” she said. Okay, and this time she said she hardly held the stirrup at all. “And again” she said. What? Oh, ok. This time she put her hands on the front and back of the saddle and even I could see she wasn’t pulling on it. On my own I would not have tried that day. On my own I would not have done it again, twice, to prove to myself that I could. In the end sharing my goal with someone else gave me the final push to achieve it. As I said, it’s work in progress. I went riding two days later and struggled to mount to begin with. It felt physical but I am sure it was all in my mind. I have to really commit and believe that I can do it, and I have to trust my horse. With my increased strength and flexibility I do not need to worry about hurting myself, just as long as I keep up the exercises. Now I find myself doing Pilates squats while waiting for my eggs to boil in the morning, five and half minutes – every little helps! A few of us in the Icelandic Horse community are planning to have a workshop on mounting from the ground, which I have agreed to organise. That should keep me focussed on practicing what I preach! When I went to bed on Sunday 6th August I was full of good intention for the next day. An update on the Little Viking Horse website was long over due, and I wanted to commit some serious time over the next week to working on my first children’s book, a fictional account of the early life of Little Viking Horse. A sort of modern day Black Beauty, with humour, Icelandic horses and a touch of National Velvet. Instead I was woken just after 1am by an explosion. Still half asleep I scrambled out of bed and poked my head through the bedroom curtains. My Land Rover was in flames. Not just a small fire, there were huge flames leaping eight or ten feet into the air, certainly higher than the height of my horse trailer that was parked right next to it. As I stared in disbelief there was another explosion. I phoned 999 for the fire service, and then could only watch as first my Landy, and then my trailer were destroyed. The horses had taken themselves to the other side of the field, but I could hear one of them, probably Fleygur, making anxious nickers. I spoke to them and they settled. My Land Rover defender had belonged to my husband, who died very suddenly last year. 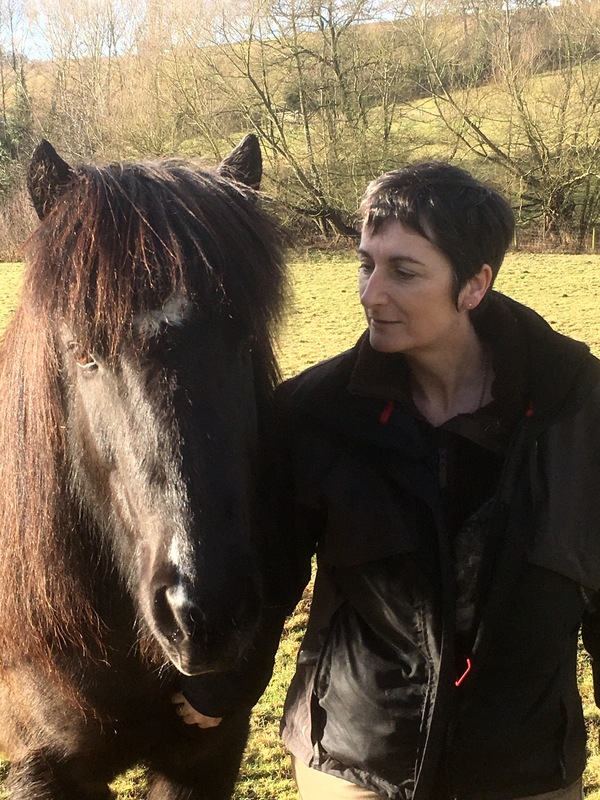 Since I lost my soulmate Roger, I have focussed on being positive, making my Plan B as good as I can, and the horses are part of that journey, one that have shared periodically on this blog, and on Little Viking Horse’s Facebook Page. Over this year I have worked hard to overcome my anxiety about towing the horses on my own, and had just got this cracked. I sobbed as I watched my Landy and trailer burn, along with many personal possessions that held sentimental value for me. It disturbed me the the fire was arson, probably a failed attempt at trying to steal the Landy. Someone had removed the doors and seats and set fire to it, presumably to cover their tracks. Such a waste of an iconic vehicle. I say that not because I was sentimental about it, but because, despite their popularity Land Rover Defenders are no longer in production. Selfish, thoughtless destruction, deliberate. Without a thought for others. What if it had been closer to the house? What if…..what if…… But it was not. Whilst it was distressing to watch, and some of what I have lost can not be replaced, I nevertheless was determined not to be defeated by this. ‘It was just a car’ I told myself. No-one was hurt, the horses are safe, and still my Plan B is a good one. I am fortunate compared to many, and after posting about the fire on Facebook I was heartened by the kindness of others yet again. People I did not know sent me good wishes and encouragement. I even had offers of horse equipment, CCTV, a gift voucher to ‘treat myself,’ and a complete stranger offered to transport my horses anywhere I needed to go whilst I got myself sorted. I appreciated all of the support I was offered, whether I needed it or not, the kindness of people shone through. 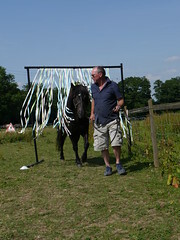 So I got to work replacing what I could, with firm plans to attend the remaining summer events with the horses. My confidence in many areas took a knock when I was suddenly without Roger. Along with over coming my fear of towing this year, I have worked on overcoming my anxiety about riding, and I am finally making some good progress. Now when I arrive home from a ride, my overriding feeling is not one of ‘phew I made it”, but one of satisfaction, or even sorrow that I am back so soon. It’s a good feeling, and being able to ride and and enjoy Roger’s feisty Fleygur (aka LVH) is a real joy. I just hope I can continue this when I take Svipur (aka Blondie on the Facebook page) to the final Show of the season in September. I have been pleased with our progress this year, and we even managed to win a second place rosette in a Four Gait* class at the Icelandic Horse Festival and British Champions in June. Not bad for a horse that couldn’t trot. *Icelandic horses are naturally gaited. In addition to walk, trot and canter, they can tolt, and some can perform a gait called flying pace. These five gaited horses can sometimes struggle to establish trot. The Four Gait class requires you to show walk, trot, tolt and canter. So my intentions of last week, to share with you more details of how Svipur and are working on improving his trot, and of how I have worked on my anxiety, were overtaken by events and will have to wait for a future post. The fire and the aftermath shocked me, and writing my book was stalled as well, while I sorted the mess. But now I am ready to begin again.